Business, education, law, service industries, medicine, government wherever you work, in whatever capacity, the Scriptures have something to say about it. 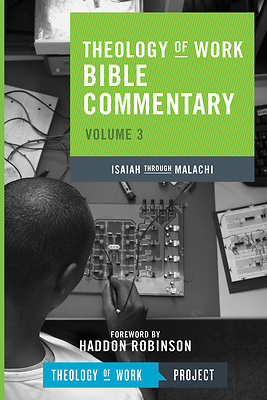 This Theology of Work Bible Commentary is an in-depth Bible study tool put together by a group of biblical scholars, pastors, and workplace Christians to help you discover what Isaiah through Malachi says about work. ""From the very beginning, God designed us to work. We each have gifts and callings intended to reflect his glory and to bring us fulfillment, even as we serve others. While there are various resources addressing this subject, this unique commentary offers a comprehensive survey of an important biblical theme. With its added online availability, it is an invaluable resource for pastors and business professionals alike." ""This commentary is a revolutionary document It does what no other commentary has done, which is to turn us around and to see what the Bible actually says about work. . . . It is about time we saw that the Word of God gives meaning, purpose, perspective and practical guidelines for daily work. It is hard not to be enthusiastic about something that is just plain wonderful and transformative. This commentary can turn the church inside out as the people of God serve God full time from Monday to Friday."